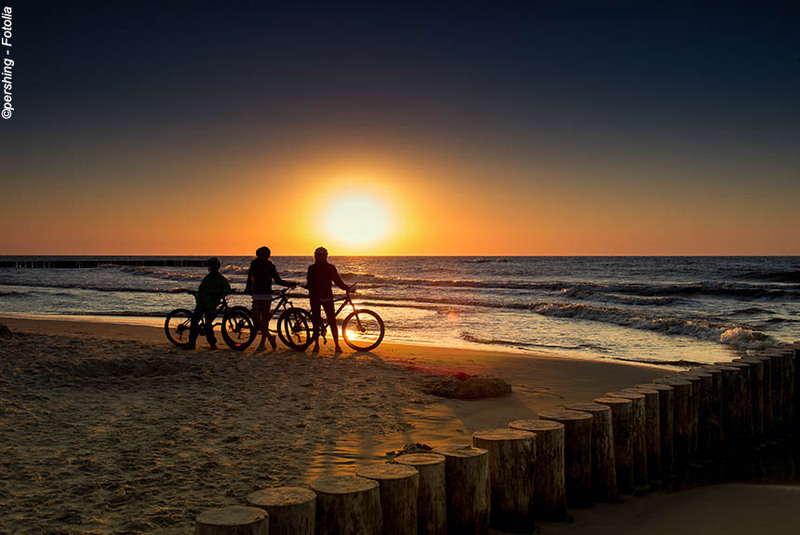 A rewarding coast to coast journey by electric bike that enables you to experience many highlights of the Pyrenees, discovering varying lifestyles, cultures and cuisines as you move from the Basque Country to the Mediterranean. While you need to be reasonably fit, this is absolutely not the "Tour de France". Over 12 days, and averaging well under 50 miles a day, this is a comfortable and enjoyable way of independently cycling across the Pyrenees by electric bike. You stay in authentic, quality hotels, eat very well, and have 24/7 telephone support should you ever need it. It is not intended for "mad keen", super-fit cyclists, but rather those who enjoy cycling and recognise that an electric bike is the only realistic way of making the coast-to-coast journey in a fortnight. This journey includes daily private transfers which are costly, and the price unfortunately has to reflect this. The boutique sized, very comfortable, two star Hôtel Lafon is wonderfully situated right by a glorious beach, so you can enjoy views of the Atlantic from most bedrooms. A memorable place to start your coast-to-coast journey from! You will eat in a restaurant just a few metres from the hotel. This is a gentle, warm-up day that takes you from Hendaye into the heart of the Pays Basque at Itxassou via two low altitude cols (the highest just 500 feet). As you can tell by the name of your destination, this is not "France". This is Basque country with its own language, culture, architectural styles and cuisine as you will discover during this first ride, but to the south you will see the highest mountain in this region, the magnificent La Rhune (and be pleased you are not cycling up it!). Itxassou is a typical Basque village with white and red buildings unlike any other region, so worth exploring on foot, not least its 17C church. You stay at the charming Hotel de Chêne (Hotel Oak), located in the centre of the village, renowned for its regional authenticity, and the excellence of its cuisine. Dinner, bed and breakfast included as every other night. Distance : 50km/31miles. Elevation : + 550m / - 500m. From Itxassou you wind your gentle way through foothill green valleys with white-and-red villages, wooded hillsides,and glimpsed, not so far away, the mountains of the Pyrenees. In the course of the day, you only cycle up a combined 1,000 feet, so you will hopefully feel ready for a beer when you arrive in Saint Jean Pied de Port, but far from exhausted. You stay at the comfortable two star Hôtel Ramuntcho superbly located close to the walls of this ancient and attractive pilgrimage town in the shadows of the Pyrenees, which is on one of the Camino routes to Santiago de Compostella. An interesting town for a stroll around before and after dinner taken in a nearby restaurant that serves authentic Basque dishes. Distance : 58km/36miles. Elevation : + 750m / - 650m. This is a longer journey that includes one 1,000 feet col, but is mostly a scenic ride through river valleys visiting villages like Navarrenx, officially one of the most beautiful villages in France. It is also your last day in the Basque Country as tomorrow you begin your journey through the Bearn region. Gurmençon is an ancient village (in 1383 called Grumensoo) on the bank of the lovely Aspe river, and is known as the gateway to the renowned Aspe valley. You stay at the authentic, stone built, family run two star Hôtel Le Relais Aspois that offers comfortable rooms - en suite, of course - and really good regional cuisine. Distance : 85km/53miles. Elevation : + 900m / - 800m. Today's route takes you through the ancient, once vast Bager forest still with its magnificent trees, waterfalls, unspoilt tracks and lanes, and attractive hamlets and villages, which you will see are completely different in style and character from those in the Basque Country - characterful and intriguing. You stay near the famous Betharram caves (worth a visit on arrival as it is a fairly short ride) at the impressive three star Hôtel Le Vieux Logis, situated in a forested landscape. Based on a traditional farmhouse, it is now a most comfortable contemporary hotel renowned for Francis Gaye's excellent cuisine - and do try the local wines from vineyards dating back to Henry IV. Distance : 50km/31miles. Elevation : + 450m / - 400m. 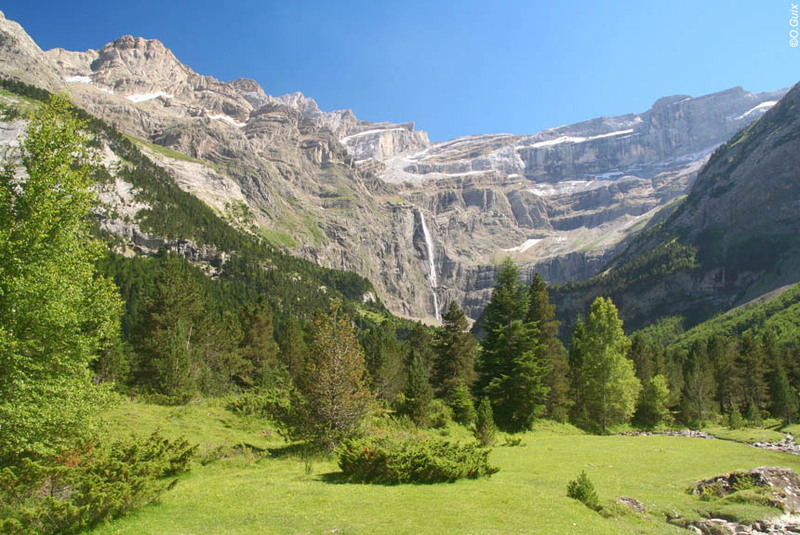 Well, you are now getting into the heart of the High Pyrenees, and today you will visit Lourdes before climbing up through the remarkable Gave valley, and enter what the French call Pays Toy, the centrepiece of which is the utterly magnificent and majestic Cirque du Gavarnie. Understandably, it is a UNESCO World Heritage Site. You will find your own superlatives no doubt because the immensity of the glacier-created, natural bowl that is the Cirque is all-but overwhelming (4 miles wide, 4,500 feet high walls, and with the highest waterfall in Europe at 1,300 feet). Be sure to visit the extremely interesting pilgrims' church and cemetery (many famous mountain guides rest here) and make the most of the awe-inspiring panoramas before heading back down the hill to your acommodation in Gèdre. You stay in the heart of Gèdre village at the "highly authentic, simply delicious" three star Hôtel La Brèche de Roland that is rightly the pride and joy of Philippe and Odile Pujo. According to legend Roland's Breach was cut by Count Roland with his sword Durendal in an attempt to destroy that sword after being defeated during the Battle of Roncesvalles in 778. This hotel is the only place in the valley from where you can actually see the Breach without having to climb up to a high pass or summit. Distance : 73km/45miles. Elevation : + 1000m / - 250m. Today you ride up through some rolling green hills with impressive views of both the high Pyrenees and the plains of Tarbes below. You are not far from the Col de la Croix Blanche. You then ride along the lovely Adour valley to Beaudéan. A memorable day's journey, we promise - in all the best ways! Beaudéan is an unspoilt traditional village surrounded by magnificent scenery, and the three star, family run Hôtel Le Catala is a great place to stay - and very much cyclist oriented as it is close to some of the mythical Tour de France mountain passes (Tourmalet and Aspin for example). A warm welcome and good food are assured. Distance : 70km/43miles. Elevation : + 700m / - 1150m. 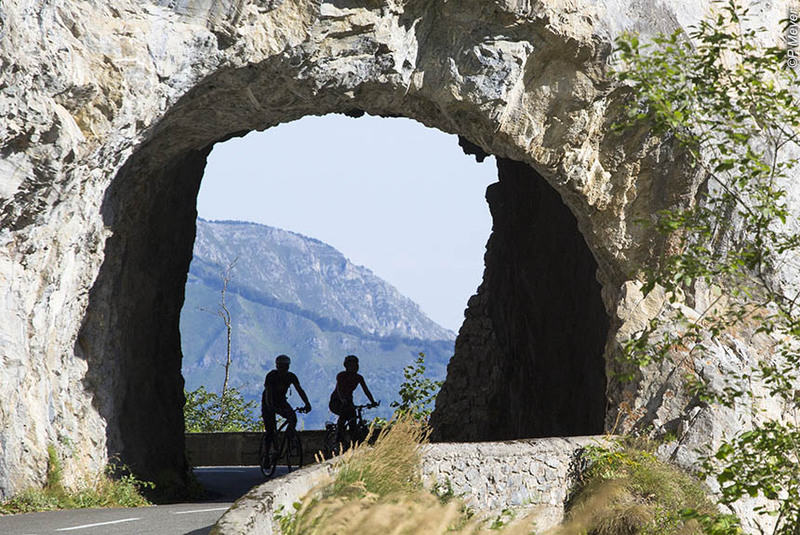 This is marvellous cycling country for those who love mountains, and who do - or don't! - like cycling up them. Your route today takes you through some lovely river valleys, not least the Barousse, amid farming country, but with the high mountains providing wonderful panoramic views that you can enjoy because you are on electric bikes. The modern two star Hôtel du Parc is indeed set in its own spacious grounds, and is very proud of its cuisine as much as the comfort of its rooms (most with balconies). A most relaxing place to stay. Distance : 85km/53mileskm. Elevation : + 650m / - 950m. This is a comparatively short and easy journey with plenty of time to discover villages and valleys en route to Saint Girons, although there is one 2,000 feet col to conquer, but we're sure you - by now - are up for that! The three star Hôtel Eychenne is a great place to stay. On the edge of Saint Girons (well worth exploring) it has its own large gardens with a good sized swimming pool, a fascinating gallery of photographs, excellent refined, contemporary cuisine, and the option of eating in the garden. Distance : 59km/37miles. Elevation : + 550m / - 500m. You are now most definitely through the central Pyrenees, and are now closing in on the Mediterranean as you will see from the changes in trees, flowers, architecture, climate and cuisine. You are in the Ariege department, and entering the Cathar homeland. Indeed just south of where you end your journey today is one of the most iconic fortresses of the Cathars at Montsegur. You stay at the Mediterranean styled two star Hôtel Castel d'Olmes, which describes itself as in the heart of Cathar country, but with a swimming pool and good contemporary cuisine it offers you exactly what you need after an enjoyable day's cycling. Distance : 81km/50miles. Elevation : + 800m / - 650m. Today you enter Pyrénées Orientales, so the east and the Mediterranean are clearly not that far away. It's good cycling country with a few, not-too-challenging cols, and plenty of pleasurable quiet roads and lanes through these warm, drier foothills between the Pyrenean mountains to the south, and the wine producing Corbieres hills to the north. The Relais de Laval is a chambres d'hôtes more than a hotel - and all the better for it in our view. It has just 5 rooms in a converted barn on what used to be a vineyard. It now looks more Spanish, although it is actually traditional Catalan in style. The rooms are simple, but comfortable, and the food authentic and enjoyable. We think you will really enjoy your stay here - and, of course, that's why we chose it. Distance : 58km/37miles. Elevation : + 450m / - 650m. This is almost a day off as it is a short and languid ride along the banks of the river Agly (far from ugly), but its highlight is a canyon that includes the remarkable Gorges de la Fou (the gorge of the mad! ), so narrow in parts that you can touch both sides simultaneously. You'll enjoy it we're sure. The primary reason for the short distance is to give you plenty of time to enjoy the truly wonderful four star Hôtel Riberach, and all it has to offer, which is a lot. Evolved from an ancient vineyard in rooms that held the wine presses, this now thoroughly contemporary and luxurious hotel (it calls itself an eco-lodge and spa) is a temple to wine (you must visit its winery for wine tasting session) and Michelin starred food created by rising chef-superstar Laurent Lemal. Is that enough to get your juices flowing? Distance : 34km/21miles. Elevation : + 250m / - 200m. Yes, the Mediterranean! You've done it. Congratulations. 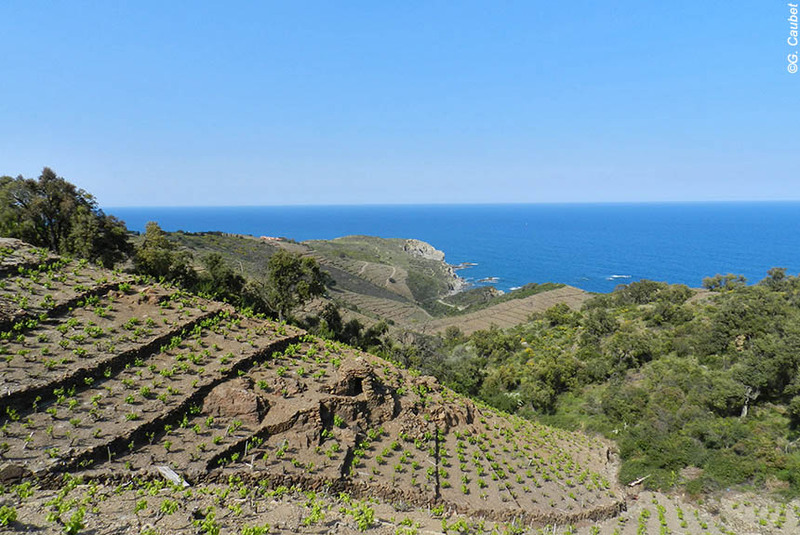 A thoroughly satisfying ride to the coast, then down along it, visiting Collioure and the vineyards overlooking the sea, until you arrive at Banyuls sur Mer, the recognised end of Atlantic-Mediterranean journeys. Sadness that it's over may well mingle with the sense of satisfaction, and why not? The three star Hôtel des Elmes provides a fitting last night. A stylish hotel right by a lovely sandy beach in its own "private" cove. The rooms are excellent - sea views of course - and the gourmet restaurant overlooks the beach and sea. Just what the doctor ordered! Distance : 71km/44miles. Elevation : + 400m / - 750m. 1st May to 31st October, subject to the dates of opening and closing of some cols in the Hautes Pyrenees, and extreme weather conditions. Do check with us, but normally all is fine between these dates. This cycling journey avoids the highest of Pyrenean peaks and cols, and often keeps to the foothills. However, it does require a reasonable degree of fitness as these statistics tell you: 12 cols; 786km/491 miles; cumulative ascent of 3,922 metres (12,750 feet); 5 to 7 hours cycling most days. While almost all routes are on quiet roads, great care is necessary because of other road users and national traffic rules and regulations. We will transfer your luggage between each hotel, so all you need to carry when cycling is a daysack with whatever you regard as essentials. You stay in double or twin rooms for 1 night in a four star hotel, 5 nights in three star hotels, 6 nights in two star hotels, and one night in a particularly good chambres d'hôtes. You will eat well. Dinners are based on set menus featuring regional specialities usually with 3 or 4 choices for each of three courses, but you can pay locally for upgraded choices. Breakfast is included every morning, but lunches and picnics are not because there are plenty of places to make your own choices, although the night before you can ask the hotel for a picnic, which you can pay for locally. You can choose the bike that's right for you, and advice will be given as to the best tyre pressures etc. Puncture kits are included, and we can advise you of nearby cycle shops if needs be. 13 nights dinner, bed and breakfast; people transfers; luggage transfers; detailed route instructions; 24/7 customer phone service, and, of course, your electric bikes. The journey to the start point, and from the finish point, except as specified; lunches or picnics; drinks with meals; non-standard menu items; entry fees; personal and travel insurance. If you want to hire a GPS device, please tell us at the time of booking. "The first thing that usually springs to mind when you think about a passage on foot across the whole of the Pyrenean chain is the famous GR10. 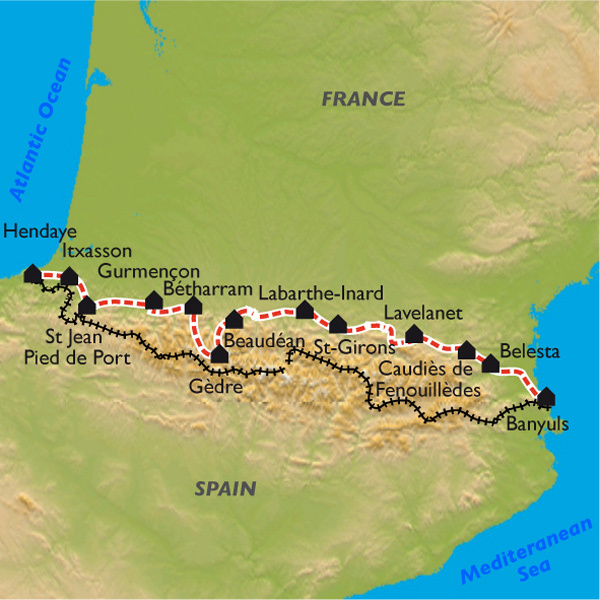 This is a trail that runs close to the border between France and Spain, from Hendaye on the Basque Atlantic coast to Banyuls-sur-Mer on the Catalan Mediterranean coast. "